A month or so ago, I finally visited OAK Long Bar + Kitchen for a proper cocktail tasting. I often neglect hotel bars, but I've heard good things about this particular one so I decided to try it. I was given a special sneak peek of their spring cocktails, which at the time didn't even have names yet! I was waiting until "spring" to post about them, and I think it's finally here, right? 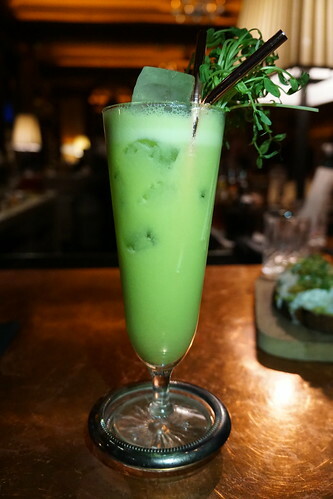 I started with one that really invokes spring, a cocktail that's now been named Home Grown. It's made with Gunpowder Irish gin, English pea syrup, lemon, honey. The vegetal notes of the pea worked really well with the botanicals in the gin. But don't worry, this refreshing drink is not overly vegetal, it was tempered nicely with the honey. The restaurant manager Will Caines did a great job pairing up the cocktails with some bites from Oak's food menu. Will was previously a bartender at Doretta Taverna. 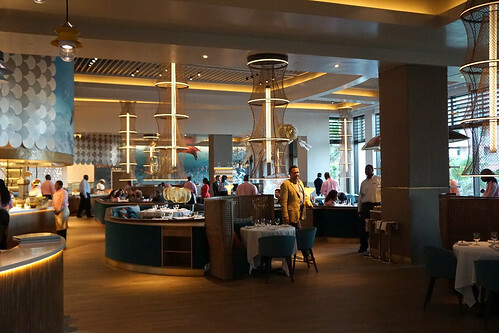 The day I headed out to The Bahamas, I found out that Fish, a seafood restaurant by José Andrés, had just opened at The Cove at Atlantis the day before (on April 12, 2018). 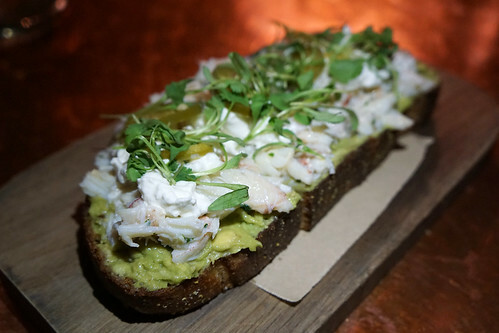 I love José Andrés and have generally had great meals at his restaurants including Bazaar Steak in Las Vegas, so I really wanted to try Fish while I was in the area. I couldn't get a reservation online but I was told that they take walk-ins. The restaurant wasn't full when I got there, and I managed to get seated in the lounge area for dinner. 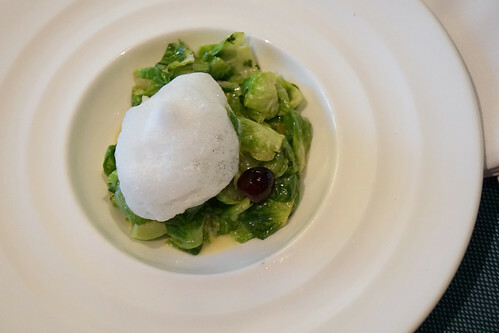 The brussels sprouts was tender and delicate and I loved the unusual combination with sweet grapes. If you haven’t experienced a collaboration before, it is an opportunity to see what is possible when two artists combine their efforts. The effort could involve many creative efforts such as a motion picture, a song, or even a breakthrough in science. 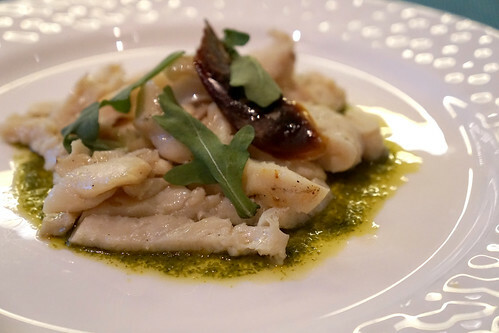 I was invited to see a menu collaboration between two entrepreneurs: Mind Fish Co and chef Teresa Montaño. Lin obtained his masters in Aquatic Biology and wrote his thesis on the Maldives fishing industry. 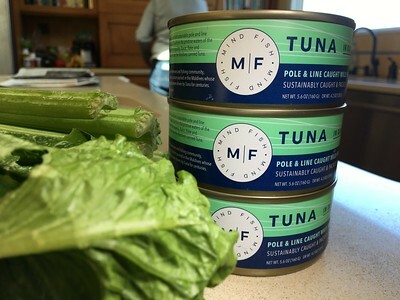 His interest and passion for sustainable seafood grew, which led him to starting Mind Fish, a company that exports canned tuna from the Maldives. Teresa Montaño was previously the executive chef of Ración which was on Jonathan Gold’s top 101 Best Restaurants. There she prepared beautifully plated Basque and Spanish tapas. 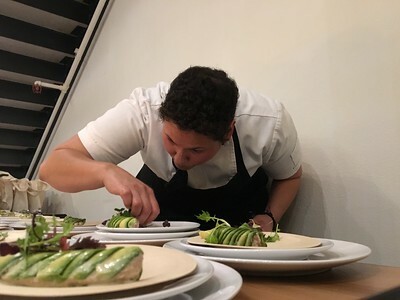 She created a Spanish-inspired menu emphasizing sustainability, local ingredients and dishes to share with Iberian wines and beers. 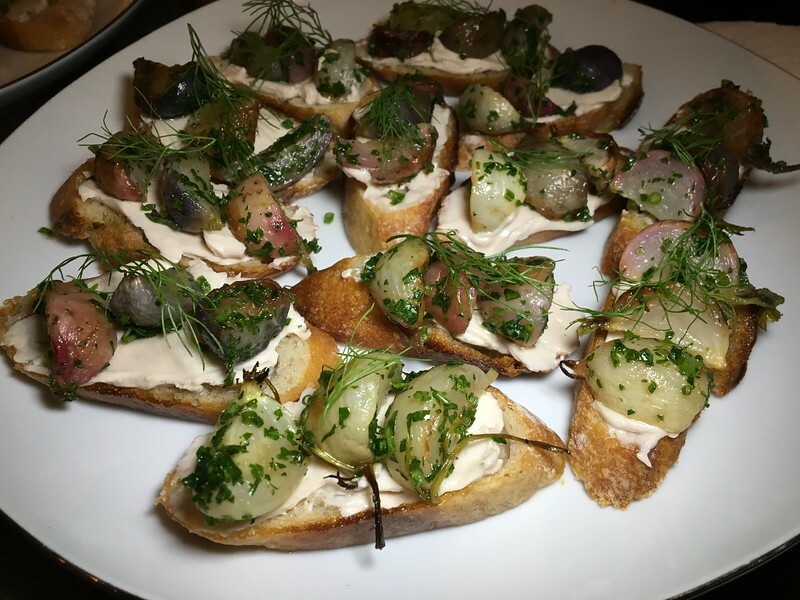 The first was a crostini topped with a whipped goat butter, anchovy and tuna and topped with roasted radishes and fresh herbs.